Total Organic Carbon, or TOC, is the measurement of organic, carbon-based contaminants in water. This contamination can occur from a wide array of sources including petroleum, PVC cement, plastics, industrial process residuals, and even bacteria. Increased levels of TOC can create interferences with other water treatment processes, clog boiler feeds and cooling towers, and interrupt pharmaceutical processes. High levels of total organic carbon can also cause discoloration in the water. AdEdge offers a line of packaged, pre-engineered APU systems using ion exchange or reverse osmosis to remove TOC from drinking water. Over time, VOCs can cause digestive issues, liver, kidney, and brain degeneration. Short term, these contaminants cause dizziness, reduce concentration, and damage the nervous system. AdEdge offers a line of packaged, pre-engineered APU biological filtration water treatment systems using our biottta®biological filtration process for the removal of VOCs from drinking water. The fixed-bed, dual stage biotreatment cultivates a robust environment for microbiological organisms to destroy contaminants or reduce elements to simple non-harmful forms. 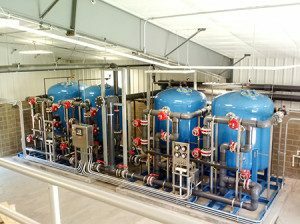 Developed specifically for drinking water applications, the fixed-bed treatment process consistently addresses contaminants at low levels, intermittent or fixed operation, and the dual-bed assimilates a complete packaged biotreatment plant with a dependability required for protecting public health.